DJT to House Ways and Means: "Here. Talk to this FINGER." 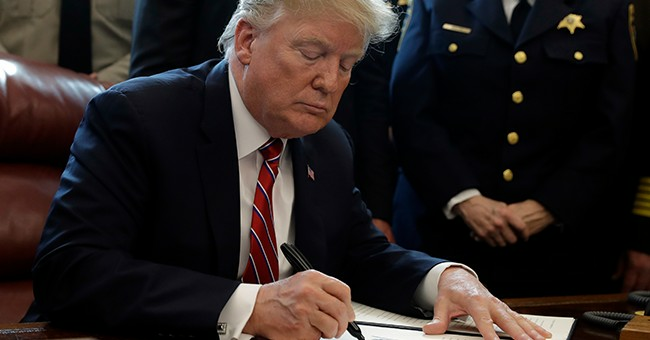 On Wednesday evening House Ways and Means Committee Chairman Richard Neal officially demanded the IRS turn over six years of President Trump's tax returns. Before a meeting with military leaders at the White House yesterday, President Trump responded. "We are under audit, despite what people said, and working that out," Trump said. "I'm always under audit, it seems, but I've been under audit for many years because the numbers are big, and I guess when you have a name, you're audited. But until such time as I'm not under audit, I would not be inclined to do it." During gaggle with reporters Thursday morning, White House Press Secretary Sarah Sanders said the administration isn't interested in playing political games with Democrats over the issue. "What I can tell you is the president has filled out hundreds of pages of a financial disclosure form which puts all of his business dealings in that, like every other member of government has to do, and it gives you a great look at the president's financial holdings, his business, and how successful he was over his lifetime," Sanders said. "We’re not interested in playing a bunch of political games like the Democrats in Congress clearly want to spend their time doing. The president is focused on actually solving real problems like the crisis at the border, dealing with healthcare, and a number of other fronts. We're not engaging in that and the president commented on it yesterday, I don't see any indication that has changed." No word yet on whether the IRS will comply with the request.